Sharpie Oil-Based Paint Marker - Marker Point Type: Fine - Ink Color: Green - 1 Each - Welcome to TABS! 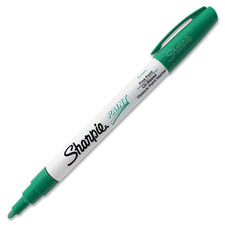 Sharpie oil-based paint marker is perfect for arts and crafts. Marker applies smooth and vivid colors. Marker makes permanent marks on most surfaces including glass, metal, plastic, rubber, stone, wood, pottery and more. Certified AP nontoxic, quick-drying ink is weather-resistant, fade-resistant, acid-free and xylene-free.